IVA-Boston conducts ongoing abolitionist vegan education for its volunteers and the public. The chapter was founded by an area volunteer who started the Boston Vegan Association in 2007. With the launch of the IVA, the BVA ceased activities so that its volunteers could join IVA-Boston and continue on with their abolitionist advocacy in and around Boston as part of the IVA. IVA-Boston takes a grassroots approach to advocacy while functioning as a part of the the IVA, and is therefore fully aligned with the IVA’s mission. We avoid activities inconsistent with or which do not fulfill the IVA’s mission. For that reason, IVA-Boston does not participate in campaigns focused on a single issue (e.g., fur), promote vegetarianism, lobby government officials, or otherwise attempt to reform welfare laws, which take it as a given that it is permissible to use animals as our property. To develop ourselves as activists, we meet monthly for advocacy practice (subscribe to our newsletter below to be notified of upcoming meetings). We also encourage local volunteers to participate in the IVA’s animal rights reading group, which improves not only our knowledge of animal rights and the abolitionist approach, but also serves as introductory animal rights education to newcomers and the public alike. Newcomers may also learn more about the IVA and veganism through orientation meetings that are offered every few months. In addition to our animal rights reading groups, which are open to the public, we distribute our own literature in busy pedestrian zones and at a popular area events, where we consistently engage members of the public in abolitionist conversations. 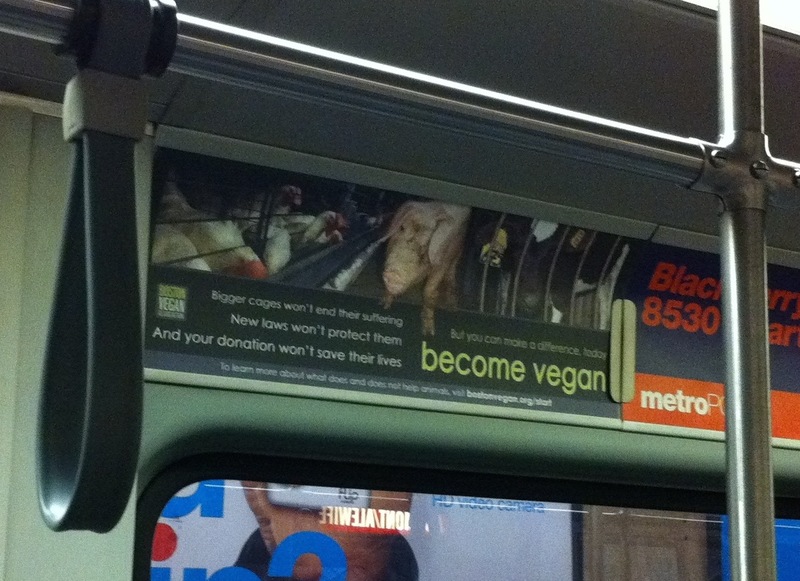 Our volunteers have disseminated an abolitionist message via MBTA ads (see left), brought Prof. Gary L. Francione to the Old South Meeting House for a discussion on abolitionist animal rights, and offered our literature free to abolitionist groups around the world (a campaign that has now been taken up by the IVA). Newcomer orientations and advocacy practice meetings typically occur on the second Sunday afternoon of each month, though we will push back a week if a major holiday causes a scheduling conflict, and sometimes forgo the meeting altogether to conduct a tabling event. To stay informed about all meeting times, dates, locations, and topics, sign up for our monthly newsletter (below), which is generally sent about a week before our meetings. We also post meeting events on our Facebook page. Note: You should also subscribe to the primary IVA newsletter.